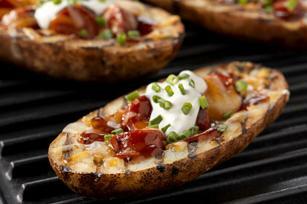 More than anything else, potato skins recipes are party recipes. They’re perfect for football parties, basketball parties, potluck parties and any other party where people are looking for cheesy potato deliciousness. And they have to be potato skins recipes, as opposed to more stately baked potatoes. Take a look at the hearty partiers below and you’ll see the difference. While other potatoes may boast cheese, bacon and other tasty add-ons, only potato skins look right on a platter with jalapeño poppers and spicy chicken wings. For more info on the star ingredient of these potato skins recipes, check out our Seasonal Produce: Guide to Potatoes.